I was fortunate enough to serve as an ambassador for the ZOOMA Great Lakes Half Marathon on Sept. 15, in Delavan, Wis. It was my first ZOOMA event, my first women-only race, and my first half marathon in more than a year. This summer, the weather has been brutal in terms of heat and humidity, and even into the middle of September, it continued to be brutal. A beautiful sunrise over the lake gave way to race-start temperatures in the low 70s. I approached the starting line relaxed. I didn’t intend to “race” this half marathon. I planned to run comfortably (saving my racing legs for the marathon) and to enjoy the course and the experience. We left Lake Lawn Resort and headed southwest around Delavan Lake, an area that 10 years ago was quite familiar to me, but whose rolling hills had escaped my memory. The pace groups thinned pretty quickly, many ladies undoubtedly holding back because of the the hills and humidity. I ran as much as possible, slowing up hills when necessary, otherwise slowing only through water stations. We ran along township and county roads, past beautiful lakefront homes. We spent about more than a half-mile (in Mile 7) along a channel that feeds into the lake, where on either side of the channel folks have small boats tied to private docks. It was so quaint! We chugged uphill a fair amount in Mile 8 and Mile 9, as we headed northeast around the lake. I maintained my steady 9:30-ish pace, until I saw my family right around the marker for Mile 10, where I stopped to kiss the girls and grouse about the hills. The route around the lake continued onto Highway 50, which by that time was busy with weekend traffic. We ran on the gravel shoulder, past whizzing vehicles, in full sunshine. I was so warm; I could feel my face was red and probably slightly sunburned. Finally, for the last 1.1 miles, we turned back into the resort, running first on a gravel road around part of the gold course and then on a paved walkway right along the lake. I had lost my reliable signal after about 3 miles, so I had run most of the race without music. I finally took my headphones out of my ears and my phone out of my belt as the finish line approached, and I just soaked in the sounds of cheering — my favorite being “Yay Mama!” from Anna and Elise. I ran through the finish with my arms up in celebration, a smile on my face. I had pulled out a really great half marathon, missing my personal best (from 2016) by only 22 seconds! I was proud. After a bit of relaxing and refueling (and imbibing with Lake Lawn Punch, aka vodka and pink lemonade), we watched Anna and Elise in the kids’ race. They ran really well and earned their very own medals, of which they are–not surprisingly–very, very proud! My heart was very full by the end of the morning. The ladies behind the ZOOMA race series did a really wonderful job resurrecting this race, and I was honored to be a part of it. The whole experience was so positive and supportive. It reinforced why I am so proud to be a part of the running community. It’s been a long time since a race recap has appeared ’round these parts… But Christopher and I ran a really fun 5K race last weekend — the first 5K we’ve raced in almost 3 years! The Hard Cider Run is a series of races held mostly in the Midwest and Northeast at orchards, wineries, and cider mills. Participants run a scenic 5K through the apple trees and earn a sweet glass of hard cider at the finish. We have bypassed so many short-distance races in favor of full and half marathons the last few years, because we opted to spend our race dollars on the Big Kahunas — races in which we get more bang for our buck. But we signed up for this one not only because it was local, but also because our entry fee got us a T-shirt, finisher’s medal, and commemorative stemless glass. The race was Saturday morning at Jonamac Orchard in Malta, Ill., about 10 minutes west of DeKalb. The weather was brutal: hot (temperatures in the low 80s at race start) and humid. We were placed in the first corral, which actually proved to be a blessing. The race was popular, although the unfriendly weather likely kept a good number of people away, but the first corral was not very crowded. We had plenty of room to run. Christopher and I didn’t have any time goals, but we figured since we were in the first corral, we might as well try to go as fast as we could, for as long as we could, given the conditions. We ran almost entirely on grassy “trails” that wound through the orchard, only stepping on crushed limestone or gravel “roadways” to turn into the next line of trees and, at the end, to come down the finish chute. The first stretch of the route was situated where the orchard has its corn maze, so it had been tilled last in the late fall; it was uneven and filled with ruts, roots, and rocks. I unfortunately stepped right in one of those holes and fell flat onto my knees and stomach. I got right back up, brushed off the dirt, and kept on. Our first two miles were 8:20 and 8:25, respectively, and we benefited from an occasional breeze. Our last mile was 9:10, when the sun was at its highest and hottest, and the breeze had stopped. The final stretch of the route was situated where the orchard has its “attractions” in the fall — a petting zoo, children’s play area, etc. — which meant all of the spectators gathered there to cheer on the runners. We spotted our family — my dad and his sister came down to watch the girls while we ran — and bolted down the chute; my RunKeeper says that last quarter-mile was a 7:50 pace! I crossed at 27:26 which is my second-fastest 5K — only 30 seconds off my personal best from 3 years ago and good enough for third place in my division. It’s just too bad the race didn’t hand out age-group awards! This was a fun, well-organized race with lots of perks! It was well worth the $35 registration and is a truly fun 5K, especially for runners who don’t often race the shorter distances or for those just starting out on their distance-running journey. I thought I might just skip this recap. But I know I would be remiss if this recap wasn’t here in the archives. So, here it is, abbreviated and completely from memory! My training went pretty well until about the final month. I started getting sick Oct. 1 and cut a scheduled long run of 18 miles down to 12 miles. I felt well enough to tackle 20 miles a week later, but I experienced aches and pains through most of the run, especially from Mile 13.5 and on. I slogged through a step-back run of 13 miles Oct. 15, again with aches and pains, mostly in my left IT band. I tackled another 20 miles a week later, tired and ready to be done with training. I started feeling really sore and fatigued the next day. I thought it was related to the long run, but I soon developed a nasty, productive cough, along with other symptoms that persisted for two weeks. I went into the doctor the Tuesday of race week to see if she could give me anything to knock it out in time for the marathon. She diagnosed me with near-pneumonia and prescribed a Z-pack of antibiotics. I toed the starting line feeling decent, but extremely nervous. 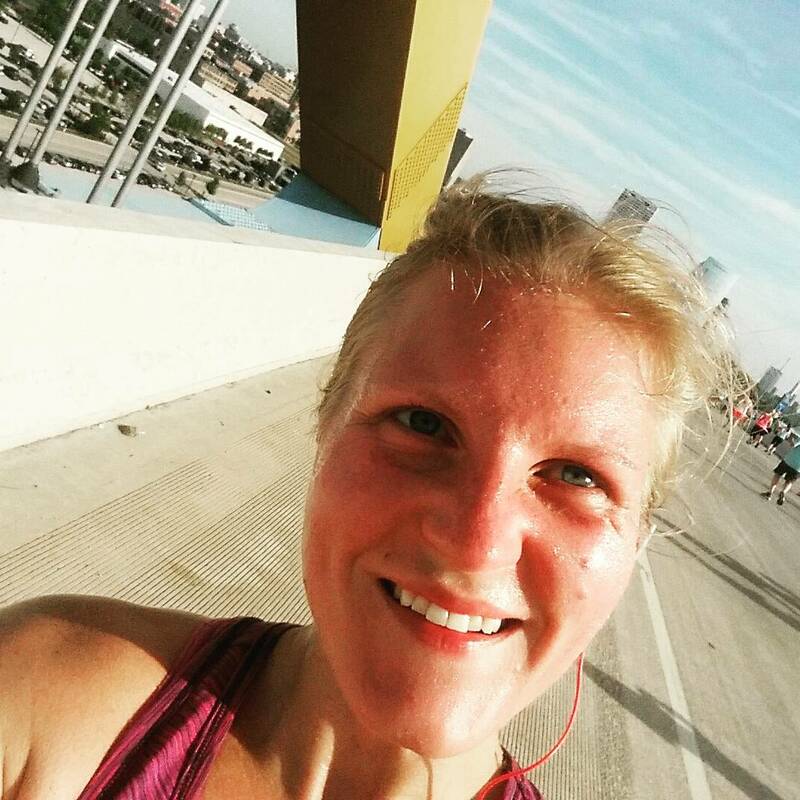 I had not run in 2 weeks, and I had barely worked out other than my regular yoga classes and one BodyPump class. I went into it knowing it likely would be difficult, but hoping it would be wonderful after a couple of weeks of true rest for my legs. I lined up with the 4:30 pace group and planned to stick with them as long as it felt comfortable to maintain that pace. Through the first several miles, I felt remarkably good. We were clocking a bit faster than our prescribed pace, but we were chatting and laughing, and I remained comfortable, so I just ignored it. We headed north up Lincoln Memorial Drive, then back south 0n Lake Drive toward Brady Street. We ran across what is (unbeknownst to me) called the Marsupial Bridge past Lakefront Brewery and then down the brick Old World Third Street. But around this point, I started to feel some tweaks in my knees and IT bands that, truthfully, never went away. We ran West down Wisconsin Avenue, through the Marquette University campus, then north toward the Sherman Park neighborhood. The half marathoners turned around at the 9.5-mile mark, while the marathoners pressed on; the marathoners cross paths with each other from about Mile 11.5 to Mile 14.5 on an out-and-back stretch of Sherman Boulevard. At about the halfway point, I started to incorporate more walking breaks. I tried to make it from aid station to aid station and just walk a bit longer leading up to and coming out of the stations. We wound through Washington Park, then down Hawley Road toward the Miller Valley. I saw my dad at the corner of Hawley and State, and I was sore and tired and I just threw my arms around him and lamented my pain and struggle. He told me to keep going, so I did. The crowd of marathoners was really sparse by this point. It was very quiet and lonely, which is just terrible when you are struggling to keep your head above water. We jogged past Miller Park and then joined the Hank Aaron State Trail for about a mile. We even did a lap around a football field just before Mile 21. Around this point, a pair of girls sidled up along either side of me and asked if I wanted to walk and talk — and maybe run a little — with them. The three of us would go on to finish the race together, mostly walking the last 5 miles, complaining that the hills were brutal, that the course was long, that none of us was having a good race. I saw my dad again at Mile 23 in the Third Ward. We pressed on past the Summerfest grounds, across Lakeshore State Park, then past Discovery World and the Milwaukee Art Museum before we finished in Veterans Park. Another marathon finish in the books. It wasn’t easy. It wasn’t pretty. It wasn’t my fastest. It wasn’t my slowest, either. (That title is reserved for my first one back in 2012.) But it was another marathon. And every single mile of the race and the training for it tells a story. This just wasn’t my race. Maybe next year? It’s worth noting that the course was, in fact, almost a half-mile long. There were two errors, according to organizers, the first in the 17th mile and the second in the 20th mile. The exact amount of extra distance was 0.489583 miles. The organizers updated our times to reflect the added distance. I’m back! And I have another (belated) race recap! If you follow me on social media (my Instagram link is down and to the right on my sidebar), then you know I am training for another marathon — the Milwaukee Running Festival marathon Nov. 6. Christopher is training for it, too. We wanted to work at least one half marathon into our training plan — just to give ourselves some incentive for logging all these miles, and to practice our race-day routines. We chose to return to the Quad Cities Half Marathon, a race we ran way back in 2012; it’s a well-organized race with a neat course and it’s only an hour from home. We were blessed cursed with unseasonably hot, humid weather, so Christopher and I agreed to go for our goal paces but let the chips fall where they might, given the conditions. He lined up toward the 1:45 pace group, while I lined up closer to the 2:00 group. My friend and fellow fitness instructor, Andrea, who was running her first half marathon, lined up with me; we agreed to run together for as long as it made sense — if I wanted to and could go faster, then I would cruise on without her by my side. Andrea and I ran together for maybe the first 2 to 3 miles before she hung back and I plodded ahead. I felt alright through the first half of the race. I was running at a consistent 9:30-9:45 pace, keeping my breathing in check and taking water and Gatorade at every aid station to stay hydrated given the climbing temperatures and bright sun overhead. Christopher waited for me (for 10 minutes!) at the halfway point, then we ran together for about 3 miles, along the river in Davenport and then across Government Bridge onto Arsenal Island. We separated at mile 11; Christopher was feeling like speeding up, having caught a wee bit of a second wind, while I was feeling like slowing down. I was sore, but more than anything, I was just sapped of any get-up-and-go. I grabbed a piece of candy (sugar-coated gummy fruit slices–one of my favorites!) near the exit from the island, and I couldn’t even chew it because I was so tired. I ran my slowest miles (10:49 and 10:36, miles 12 and 13, respectively) on the island and then across the Moline Arsenal Bridge and back to downtown Moline. But I picked up the pace as much as possible through the final straightaway and clocked my fastest pace (9:24) to the finish. I breathed very rhythmically, in through my nose, out through my mouth over that last tenth of a mile. I crossed the finish line and got pulled over to the medical tent to sit down and slow my breathing, because it felt like every ounce of oxygen was caught up in my chest with nowhere to go. Christopher and I milled around the post-race party for a bit, grabbed some chocolate milk and then beer to refuel and celebrate another race–and a course PR! We waited for Andrea to finish, and then for a couple other friends to finish. Given the unseasonably brutal temperatures for a race, I was happy to have maintained an average of about 10 minutes per mile and finish only 7 minutes off my half-marathon best (and almost 15 minutes better for the course). It was just another marathon training run, just with aid stations along the way and a sweet medal at the end.